Being present in the walk. From the moment hearing about the Women Gathering for Global Change Conference in Alexandria, Egypt, intuitively, I knew I needed to be there. The whys were not clear at first. 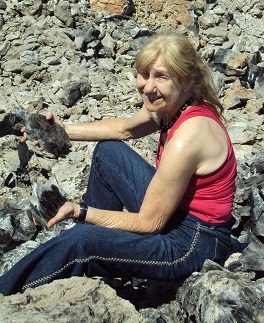 They gradually unfolded and completed the understanding after returning home to Mount Shasta. The whole trip was profound and revealing in so many ways, far beyond visiting the pyramids. Not wanting to make any part less significant than another, telling the stories in a type of context is important to me. ceremony for healing and understanding of the events a week earlier. A collective activation of heart compassion took rise, something that had not been experienced since Princess Diana tragically died in August, 1997. Heart compassion knows no boundaries, race, religion or agenda. We, the collective, united as one heartbeat of compassion and empathy can change everything! After parking my car I headed up the mountains to about 11,000 feet to find the right spot. A glade opened up with a natural circle of stone and trees – the perfect place. Drum in hand I began to beat the sounds, songs and prayers. Simultaneously, outside of Kansas City, my friend Toby Evans, Keeper of the Prairie Labyrinth, was also holding ceremony within the beautiful labyrinth on her land. Walking, pacing, sitting, standing – the sounds of the drum continued. Sometimes the sounds were off key, other times like a cry – the drum was speaking. The circle called! Standing in the middle of the circle, slowly turning, the beat continued. Around and around, turning slowly, images came and went. Bubbles of spirit energy would rise up and in a fraction of a time burst. The drum beat rejoiced at what was happening. More images of lands in pain, of loss and death. Native lands, Ireland, Bosnia, Germany, Japan, Middle East, Vietnam, South Africa and more all came into view as I turned and turned with the drum beat. The images changed. Labyrinths began appearing as transparencies above these lands and places. With each turn the labyrinths expanded to eventually be over continents. A labyrinth transparency above each continent – Europe, Asia/Middle East, Africa, North America, South America, Australia and Antarctica. The turning was getting faster. The drum beats and sounds changed over each land mass as I turned. Dissonance, pain, flat, dead. I kept playing, singing and crying – turning all the time getting faster and faster. Every now and then a change, a shift happened. The sounds evening out. Faster turns, sounds clearing, songs rising. Suddenly the visions and sounds were clearer, the beat becoming one! 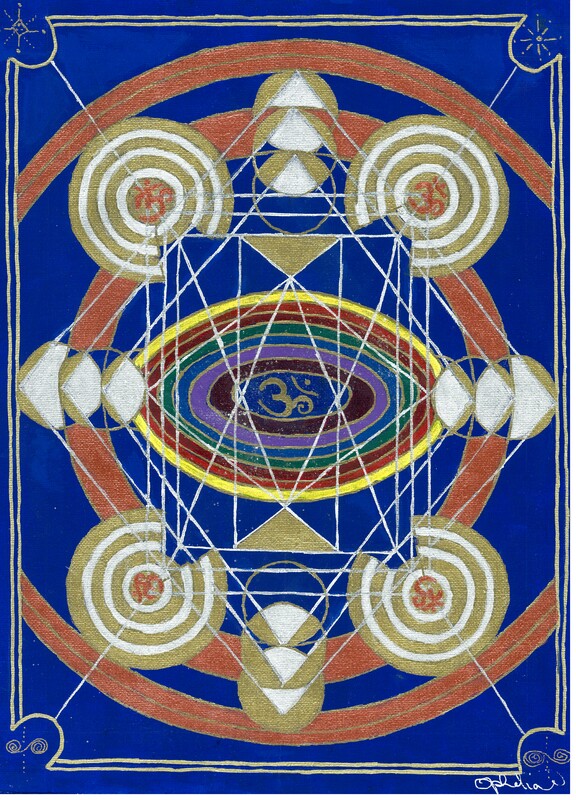 Within the labyrinth above each continent a dark energy stream pulling up and out from the lands towards the center OM symbol, moving through the holographic paths to the white bubble above. Light increased until the turns, the beat, the sounds and vision were all ONE – it was the most amazing feeling and sight to witness from within. Then in a moment in time the white bubbles filled with darkness burst and released to the heavens. The turns automatically slowed, the drum beat softened, my tears flowed so freely and a lightness surrounded the glade. What I believe I witnessed within the vision and the sound was the honoring and releasing of old earthbound spirit energies, locked in lands and people though time, possibly eons of time. 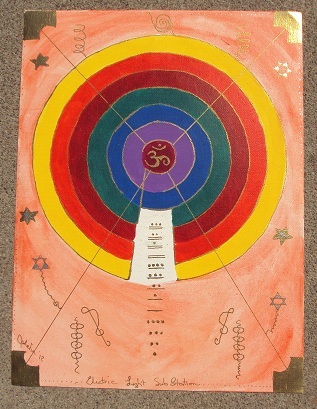 The labyrinth created a portal of safety for release and healing on levels beyond our knowing. Taking the The Walking for World Peace Labyrinth and the drum to Egypt was the manifestation of a personal vision and desire I have held for many years. To physically take a labyrinth to a place or region experiencing conflict and adversity. To lay it out and allow local people to quietly walk the meditative paths. To have their own experience whether subtle or profound yet most all have fun with the unusual colorful spiral of geometries. I was gifted profoundly with meeting beautiful people and learning much more of that ancient land and culture and the strength of the Egyptian people. The labyrinth and the drum I used in the original ceremony in 2001 were left with The Human Foundation in Cairo to be used for others to enjoy and discover! It is from the experience and visions on the September day in 2001 that my diverse knowledge, work, art and sharing of the simple, colorful, innocent labyrinths have evolved and continue to be expressed today. The Past catching up with the Future….in which world! This Earth Spirit Journeys‘ blog has certainly been a long time coming! Since January 6 I have made an amazing drive across from West to East coasts and mostly back again as I am now in Denver. Northern California to Florida to Missouri to Colorado….pushing 6,000 miles. Tomorrow from Denver I head for Taos, NM for a stay of at least 3 months. And all this magically unfolded less than a week ago. What has been so interesting about this whole time is that I have been “revisiting the past” . My friends in Denver were best friends of my children’s father growing up. 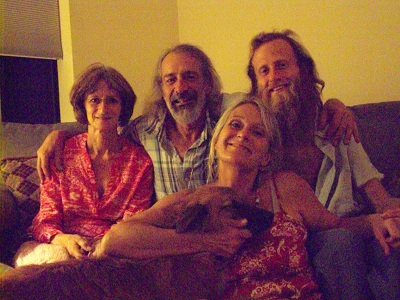 I meet them in 1978 when we moved to the US from Sydney and I hadn’t seen or spoken to them in years. I was also taken back to 2003 when I drove from Denver to Florida’s East Coast on faith for unknown reasons and outcomes. Serendipitous meetings, emails and phone calls from people I knew back then and in the years between till now have been showing up. Comments like “I just started thinking about you”; “came across your business card”; “your name came up in conversation”..…..Has this happened to you lately? Are similar coincidences happening and having you revisit the past in different ways? What prompted this posting today was some writing I came across when reviewing videos I produced years back. 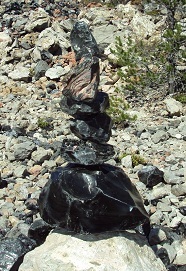 The writing was “channeled messages” of January 1, 2010 when in Mt Shasta, CA. The tone of the writing is unusual and old. I now remember hearing those voices and language patterns quite often yet have not for quite a while. Today I realize I miss “the Collection of Many” as they called themselves. I hope they are getting ready to return! electrical flow and all connecting elements of gold , silver and copper. Their message was very firm in this regard……Skull is the incorrect term for these crystal forms. The skull is the bone casing that holds the brain in place therefore it is not the skull that has the intelligence yet the brain matter within, thus the term “Cranium” should be used. And the Brain is the “beautiful door” to the knowledge, intelligence and consciousness gathered through Mind and Universal Space Frequencies. Sounds like they are here! And somehow all of this is tied to the meanings and purpose within my latest paintings although that is yet to be revealed. 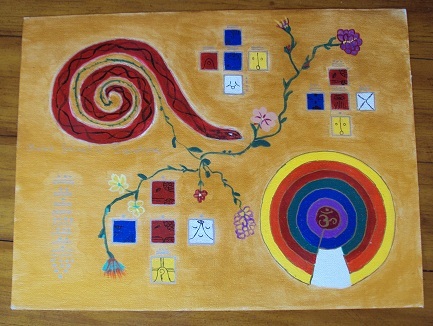 These last two follow the flow of the painting in the last posting “Healing the Waters of Japan and the World Mandala”. I don’t have names for these yet they are powerful when standing on or in their presence. So interesting this arty journey! Below is the writing mentioned. The timeline is the clue. As you will see they were preparing me/us for the times we have passed through and are in now. January 2010 Mt Shasta Max the crystal skull coming to house! My greatest potential from all incarnations of soul and physical being are coming forth now for total expression of knowledge. Thus within time you will reveal knowledge and integrity of the past that were compromised and revoked and later hidden for the protection of man and life as you evolved. Can you now handle the truth! Can you on earth now use and accept universal truth as it was intended rather than as it has been adjusted and manipulated! You are in a time of proving once again if your combined consciousness is willing to take this path. The truths you are seeking are for the community. You are soon to be connect with the cranium of Max – Ukanatun., will take you and others into remembering process of the past in new ways not shown until now. They think all is known of Max- Ukanatun, yet there are surprises in store and we look forward to seeing once again the brilliance of your smiles for these to will light the way of seeking. Remember little one the stories you were given in that place of St Augustine – the village, the landing of the Spaniard, Ponce de Leon, the tiny child and his father, the Chief – you were remembering an important time. Remember the coming together of the circle of the craniums atop the ancient mount in the land of genocide –there was so much work ,as you call it, done. Re-walking the land once fled on, anew, on occasion. Review the pictures of mountains and you will see with eyes beyond now – breathe and pray to surrender souls caught and flowers will bloom where none have bloomed from times long past. Remember your entry into the crystal room within the Grand Pi. (Great Pyramid) Regard once again the diamond. Its modern understanding to access the alchemical meaning forgotten. Remember your joy and awe upon returning to that table of never leaving yet traveling beyond. As you know, all the experiences we give you are always witnessed as you call it by many others so you cannot ignore and deny these realities. Remember as you write you reignite the memories of the puzzle pieces thus spread upon the table. Yes, you understand there is always far more than one picture scene within the vast design. Can you share with me who are you transcribing through me? We are a collection of many from places beyond. Just as the raindrops on the branches of today – we come and go as nourishment is needed. We shall return. 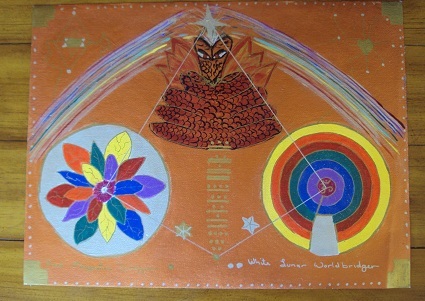 <> (JM) Represents a zoomorphic head with possible infixed rainclouds (the so-called bunched grapes) and the rainbow. See KAWAK and ku. Through the fog and mist one sees little but the veil yet as the mist clears all behind is revealed. This is what you are seeking. Yet the mist cannot be cleared before time has moved the weather flow and set the new cycle in motion. And so it is with where you stand so to speak. We have taken you back and through remembering in these past days and nights your sleep has been in stillness so contrary from weeks earlier. Much is being transferred. As you were surprised to learn of the secret at the end of the chess game, is that not what you all seek – The Elixir of Life. As that man first encountered on the shores of this so called new land, Ponce de Leon, as the tiny one, you saw the darkness and knew the secret must be hidden. All your journeys through the eons of time have been to the same end, for that is what you knew so long and it was destroyed. Well of others you all in connection must show and stand strong in integrity of the great secret. This secret is simple in its manifestation yet so complex in it derivations. The pieces we have revealed again, place them on the paper at random and as revealed lines will form and you will see the next clue. We smile at your joy of revealing! Regard the map of where you have been. Place a X to mark the spots and then step back and time will do the magic for time is the clue yet not your time as known now. Ukanatun – the cranium of Maximus de Porte Belle will help unlock a chamber of time. 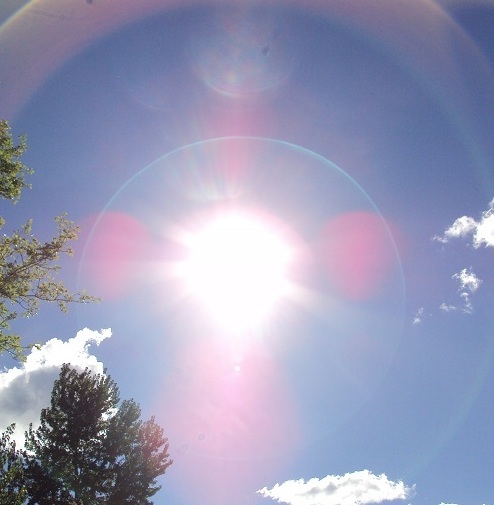 Remember there is much between the heart and point of light within the middle head – Ou les vielle de faire voi! Your friend the fairy of your court played in the land of illusion her memories here are true and hold a clue to all. The one who lived in solitude yet not in mountains far is seeking hard too much to push – step back and see the fair veil true. One he knew in robes saffron bright taught well yet missed the mark. Fair he be careful now to not fall into same trap and fail to see the light. Answers lie within the many as you both have learned to see so be aware and trust within. Remember your Russian/Pole who danced as free. Cosmology, Physics, Biology were the path he took and found the pot of gold. Yet listened not to counsel wise by staying with the chamber bare for all around fear truth more than the light of Elixir pure. This man of wisdom rich, you talk again to see and hear and help in just to be – for presence is a power import, as the mists you presently see. Presences, patience, peace – 7 is the key! 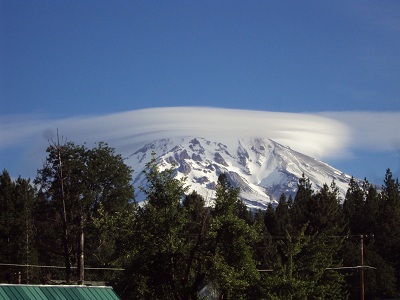 I am back up at Mt Shasta, CA – resting, recuperating, reviewing, renewing and recreating as the first winds, rains and snow of winter present themselves. This is a place I have cherished for the past three years. During the many times I return here after travels to many other places I find myself immersed into certain growth and creative junctures. 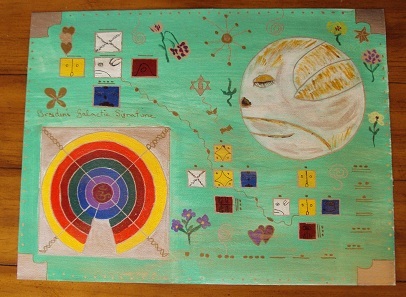 In the past two months the desire to paint has been present and now I have the beginning of a series of what could be called Galactic Signature Art, based on the 13 Moon Mayan Calendar. This calendar represents Mayan Astrology and like traditional astrology’s, a person’s birth day is significant to creating and understanding one’s identity and personality signature of how we relate to the world around us. In less than a month on December 21st the much touted and long awaited “end of time” is upon us. Something new awaits us, our world and universe yet we have no idea what it is or how it will play out or even if it does have any effect. This is based on the 5200 year prophesy of the ancient Mayans and has been especially anticipated for the past 25 years. December 21 – Blue Resonate Hand – signifying Accomplishment and Knowledge – the last day of the 5200 year cycle. December 22 – Yellow Cosmic Star – signifying the New Beauty, Art and Light of The New Earth that is possible in Transcending from old to new. July 26, 2013 – Yellow Galactic Seed – first day of an entirely new calendar which has not yet been revealed…it is still in SEED form and germinating out of view. Galactic or from the High Universe, what will be birthed on and for the Earth will hold new, different and unfamiliar harmonics, vibrations and frequencies thus offering all of humanity a massive rainbow of possibilities and opportunities to choose from and creative with. The inspiration for the first paintings came from the birth of my grandchildren and the inspiration of others seeing their paintings. As each background is done with metallic paint photographing them does not show many of the special subtleties on each canvas. 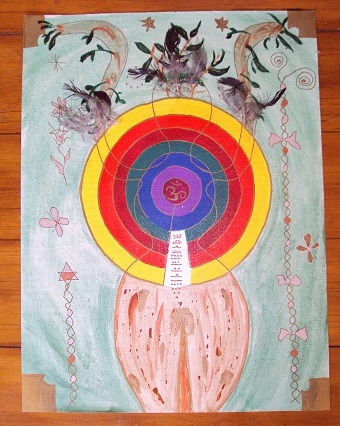 Along with the Natal Seals I tune into the uniqueness of each person and what is asking to be included in the piece. Each is a “one of a kind” painting. I am accepting commissions for the unique individual paintings which can make very special holiday gifts for family and friends. Name and Birth date information is required. Each commission is for a donation of $100. 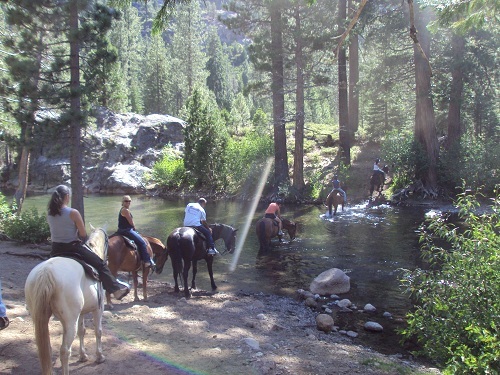 After spending nearly six weeks away visiting my sons and their families and being blessed by so many joys and memories (see previous posting) I am now back on the West Coast in Northern California, at present house and pet sitting for dear friends. Next week I head to Mt Shasta once again to spend a good portion of the winter, if not all of it and beyond. My life is much like everyone’s these days….plans for next moves don’t quite fit or resonate, lots of ifs, buts and perceived lack of support in so many ways…..thus very short turn-around plans are more called for with the caveat “pay attention to the synchronicity” each day for revision status if necessary! What many people miss in the desire to plan outcomes and control people or situations is that the only piece that is reliable is “OUR OWN and how we respond in light of our knowing and perceived desires”. What is out of our hands and control is how “the other/s respond”. This is a big lesson….in the fulfillment of direction or action can the more appropriate gift or outcome be seen! In your or any person’s private world there are those few who you can rely on to honor their word and actions. Then there is the other extreme with those who continually let you down at the last moment with excuse after excuse as to why not, yet many of us often hold the hope that they will change. And then there are those who “drop the ball” by being influenced by a third or fourth party whose insecurities are more at play in sabotage and to not have a chosen outcome, plus all other scenarios in between. I am not beyond reproach unfortunately. There have been times that I have disappointed others, not intentionally yet perhaps I was too wrapped up in my own stuff, pain and insecurities to not see what was important to someone else. I try not to do that now yet I am not perfect! Now when I fall short I hope that “other one” can communicate and discuss what went wrong so clarity of connection can be established or re-established. If “they/we” don’t understand each others language (emotional, mental, generational and locational) then confusion and misunderstandings will always continue. Do you Listen well and in turn Do you Hear what is being said? This topic has come up recently with several friends in very different circumstances as well as for myself which makes one question what is being done wrong or incorrectly. Others choices influence outcomes! While in Florida I had arranged to do some work with a client and present a workshop or two. We discussed everything and planned what appeared to be a great experience for all. This client also wanted to bring another “friend” into the planning which was OK with me. Topics, dates, ideas, fees and financial benefit/expenses for me were all covered. This was to be held in a very affluent area of Florida. I departed on the four hour drive with positive expectations. During the next three days staying at my client’s home I was teaching and sharing life experiences as learning tools in relation to her questions and desires to learn and grow further. The day of the gathering eleven people were scheduled to be present (as I was told). During earlier conversations little pieces of information and concerns over the behavior and motives of the friend were brought up….red flags…..I could express my concerns and opinions yet knew I had to just play it out, do what I had come to do, teach and example. As it turned out among other things…the friend arrived late with one other person, created delays totaling 45 minutes and left only a small portion of the agreed fee in change. The several other people there were very nice and interested. What I had planned to discussed got changed, not by me but from my guidance. Although the original topic on “Four Principles to Empowerment -To Release, To Claim, To Give and To Receive” was covered during the evening it was not as I had expected yet through other examples. Many other topics, not on my agenda were inserted and all in all it was a very powerful evening. A friend of mine who offered to videotape the evening commented later that I didn’t stick to the publicized topic. I agreed yet also had to say that because of all the other “changes and undermining” done “guidance” chose to move me and the information in other ways to the benefit of those present. The actions (unknown to me) of one person influenced everyone originally interested in attending to the extent that many did not arrive. Later that evening I further learned my client had been influenced/told not to book any private sessions for me; that being paid was unnecessary and that I was competition for her, even though I was only in the area a few days! The icing on the cake so to speak came the next day after holding ceremony with the Labyrinth for my client. She had a profound experience bringing up tears. I shared with her that because of her friend’s actions many others had been denied the same experience she just had and that was sad. Of course the whole experience would not have been complete without having to hear from my client “oh I don’t have any money now!” This was not true when her circumstances were seen from other perspectives, what she really had hidden away and some funds were provided. In an ideal world there is the never-ending cycling and spiraling of energy to fulfill all our needs and desires, the real flow of the Four Principles to Empowerment. Yet when fear, control, doubt and lack in any and all forms surface then the beautiful magic of manifestation, love, growth and generosity are lost. The huge losses from Hurricane Sandy, the generosity of unknown little people of humanity to help those in need……giving $16 million plus to big corporate entities like The Red Cross whose partial Mission is to help those in need, their Other Mission is to make money (research yourself) those in Need who are now asking where is The Red Cross, FEMA, Governments, Corporations and the Billionaires of the World to open their coffers wide and free of strings to release the massive financial energy locked away that has been gained at the expense of our World’s Population, every single person. The Golden Age of Change is upon and within us…….In just over one month – 12/21 and beyond marks the absolute new beginning of time, space and life – a Beam cycle of 26,000 years literally ending for a new Beam of Light Life to be chosen…..these concepts are so far beyond what most anyone can fathom, never the less true. Exercise: Standing at the crossroads, five doors appear around you…different colors different directions and different designs……contemplation, meditation, patience, love, compassion……which one will you choose to open and turn the Light on……the Light will reveal Heart and Soul’s desire! For now Blessings to All…Until……..
Where to start after such a long break from putting fingers to keyboard as opposed to pen to paper. The last entry was dated July 26…the first day of the new year based on the Mayan 13 Moon Calendar. Because my WP date loading is slightly off and it was actually written and posted on the 25th – The Day out of Time. What has transpired since then has been quite amazing in so many ways and on so many levels thus with the help of my current day timer I will recount parts of the journey. Right off the bat I will mentioned that many, many of my experiences were “internal in nature, very personal or totally beyond words” yet I will share what I can. 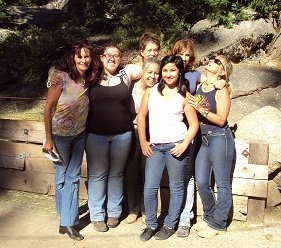 On July 24 th I held ceremony at Shastice Park in Mt Shasta in the presence of seven other friends. Using the 12’x15′ Walking for World Peace Labyrinth each person walked and “held sacred space and intention” for one of the seven continents, them-self and their immediate world. This was to anchor in a presence for the transition into the new times marked by December 21, 2012 and beyond. Within less than 24 hours my friend Nickki “in synchronization with flow” meets a teacher extraordinaire of the deep inner knowledge of the Mayan Calendar and the work of Jose Arguelles. For 20 plus years she had worked, learned and followed within the inner circle as Jose and Lloydine tried to open minds and present this work to the world. What st arted for us as an overnight visit ended four and a half days later….hours and hours spent around a table in a home outside of Ashland, OR. Nickki and I were opened to information only to be found in the Cosmic History Chronicles (seven volumes) authored by Jose Arguelles and Stephanie South. From the amazing vastness of information, the complexities and new explanations of Earth and Galactic history I now know more than ever, that our collective humanity has and continues to be manipulated, lied to and controlled by and with such hard to imagine power by very small and select few groups (on and off Planet Earth) only to benefit themselves and their ultimate purposes. This has been the case for seemingly thousands of years! And a long with this knowing I have also realized how incredibly imperative it is NOW for each beautiful, individual, divinely created human being living on and in all places on Earth to know and search for their own SELF and move beyond playing the clone robotic games. This is a massively tall order, for myself included. Yet to do nothing is more destructive than to pretend doing something and denying the problems surrounding us every day. Please do not think that just the first thought and action a person takes won’t make a difference to the grand plan. (even to prove that I am totally incorrect, if not a little delusional) In fact I will challenge each reader to disprove what I am saying. Yet before there is any spouting off of accepted biblical texts from any of the religions, scientific, medical, metaphysical and paranormal treatises from well anchored sources…..first go to the pure source of ENERGETIC, VIBRATIONAL truth WITHIN YOU, then to NATURE, then to PLACES OF NEW INFORMATION THAT CHALLENGE YOUR COMFORT ZONES, then to COMMON SENSE and then THE WORLD AROUND YOU and the VOLUMES of CONTRADICTIONS in every day life, media, government, health and so on. This searching alone can be your first contribution to building the necessary conscious awareness on Earth for stepping into Earth’s New Humanity. Apart for a 10 day break from the end of June to mid July I have been camping on the sacred land of Mt Shasta, CA. This is the third summer I have followed such a calling and only yesterday did I move from there to get ready for a new journey. Durin g the past months of living in the woods it has been amazing the diverse people I have met and the many incredibly circumstances presented along the way. New friends from here as well as UK, Europe, South America and beyond as well as old friends visiting to enjoy the land and magic; giving assistance to others in need – ranging from others in several life threatening events to just the encouragement in word, deed and/or donation. To really understand the unusual evolution of a friendship, love and a possible “past life/karmic connection” being revisited yet also knowing it was only for a special time and letting go would ultimately be required. 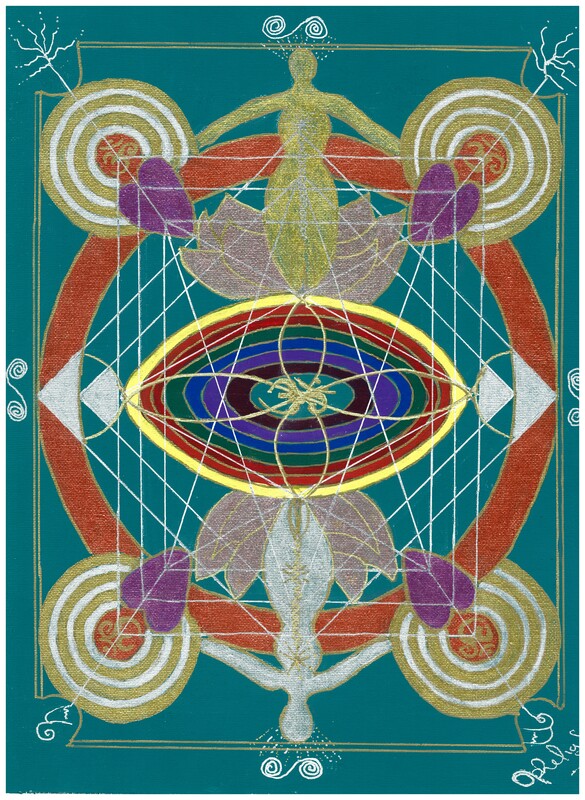 Also once again the mountain and land activated new creative juices in the form of art mandalas and galactic signatures to expand the labyrinth story and power further. During the past two summers on the mountain I created a 2-hour theater production, the Peace Labyrinth Tour and a collection of games and cards to promote spiritual and intuitive growth. Next week I leave on another journey to Kansas City to meet my new grand daughter along with Dad/son, Jerame and Mum, Kate; then to Tampa to reacquaint with grandson, Brayden and Mathew/Dad and Shannon/Mum. Such blessings I look forward to! Florida is also allowing for me to visit the East Coast (Florida) for a few days, where I lived in 2003. To meet with old and new friends and clients and share my knowledge and healing gifts in a workshop or two. 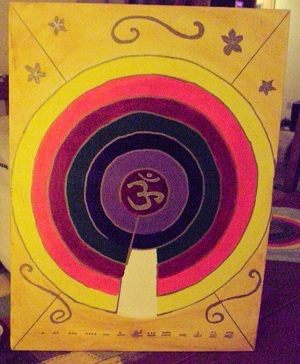 For now I will say ….Until the Muse is moved again….. Open yourself to art, creation, the new. I have never painted in such ways before…if I can, you can try the new also! Blessings to all during each day of these powerful times. The Day Out of Time……where is it taking us? So many apologizes are sent to you for the long void…..for me there have been so many journeys, movements, creations and conferences to prepare for and participate in that the writing juices have been lost or actually dried up for the moment. Plus so much of what has been happening in life is in the realm of “beyond words”. Today is the Mayan Day Out of Time – the last day of the Mayan Year calendar…..timelessness incarnate so to speak. I am once again in Mt Shasta feeling, being, learning, creating, doing ceremony in service to the earth and humanity in my unique way. Wait for even more clues, synchronicity and movements in your lives to push your evolution as a beautiful perfectly imperfect human being into the waiting new higher awareness of life –for this is what life in about! I am officially going to take a little more of a break from writing this blog. I am in such gratitude of all of you visiting and sharing in this journey. I shall return in a few weeks with hopefully something profound to share.